As many of you know, on July 2nd of this year, we lost one of our Australian pilots, Colbatman. The Col, as he was called by friends and fellow pilots, was an active member of his local gaming group and promoted not only playing Wings of Glory, but also the hobby side of the game with painting many planes. 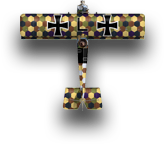 Before his passing, the Col selected two of his lovingly painted and rigged Shapeways planes to be raffled off in his memory. Here in the very near future his surviving wife will be moving so that she can be closer to their son. As we all know, moving always comes with extra financial expenses and the funds raised here could really help the Col’s family out. In honor of his request, it is with fond thoughts and a heavy heart that I post the Colbatman Memorial Raffle. This raffle will have two groups of prizes. The first group in concludes a Caudron F-40 in Belgian colours with its unique "grinning skull" nose art plus a Vickers FB 5 "gunbus" in CDL British finish. As you can see both models are rigged to Col's excellent standard. This group of prizes will be awarded to one lucky winner. The next group of prizes, one each of the Wings of War RAF R.E. 8 miniatures, was graciously donated by 7eat51 and will be awarded to a second winner. Everyone that enters the raffle will be awarded the Colbatman Memorial Medal to proudly display on their profile page and each of their posts. Please use the Paypal drop down and button below to purchase the raffle tickets. Each ticket is $5 and you can purchase as many tickets as you like. This raffle is now closed and the winner will be drawn later today!